“In some senses, the science-policy process can be likened to a sausage being made,” said Dr E. William Colglazier in his lecture at IIASA this week. We could take this in different ways: that it is messy, perhaps, or that things get churned around or made to fit. But the most important parallel must surely be that if it is done right it can bring huge benefits. In this case not for your taste buds, but for humanity. It’s a messy business, but it’s surely worth it if we get it right: comparing the science-into-policy process with the art of sausage making. If anyone knows what the science-policy process is like, it is Colglazier. Soon after completing his PhD in theoretical physics in 1971 he became a fellow of the American Association for Advancement of Science, providing advice for policymakers. He has been at the forefront of the science-policy interface ever since, and is perhaps best known for his role as the Science and Technology Adviser to the US Secretary of State from 2011 to 2014. During his lecture Colglazier explored how scientists can best advise policymakers. 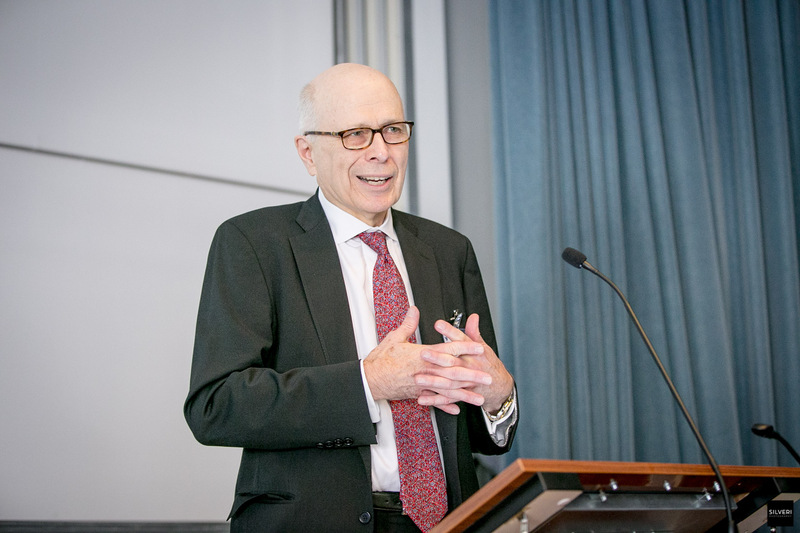 “There’s an old joke: if a policymaker asks a scientist what time it is, the scientist will tell him how to build a watch.” To avoid this, Colglazier says, scientists need a fundamental understanding of both the needs and time frames of policy making. For their part, policymakers do not always understand the scientific process. To prevent this causing misunderstandings, scientists must be clear about the uncertainties in the science, and what it can and cannot say. They must explain exactly how the evidence leads to the recommendations they have given. Colglazier also emphasized the importance of communication, something I silently cheered for, as a science writer often hoping to reach policymakers. “Telling a good story with persuasive anecdotes is often more influential than a dry, hundred-page report,” he said, and I couldn’t agree more. I have seen articles about accurate, rigorous, and important science drift by unnoticed where others, based on a more trivial studies, spark debate and engagement. The difference is often that those in the former category are three pages longer, full of impenetrable jargon, and bury their juicy conclusions at the bottom. Dr E. William Colglazier giving his lecture at IIASA this week as part of the first joint JRC-IIASA summer school on evidence and policy. Sometimes, scientists are asked to advise on issues that go beyond science, straying into value judgements. For example, when assessing an environmental risk a scientist can give the numbers and the uncertainties and information on the consequences. But they cannot provide a definitive answer to the question that the policymaker is really asking: how safe is safe enough? Does that mean scientists should steer clear of this territory entirely? No, says Colglazier. “Feel free to give advice when you are asked, but be honest about what the science can say.” The important thing is to remember that scientists have no special expertise when dealing with value judgements. Ultimately, the science-into-policy process is a messy one. Scientists find it difficult to grind up the prime fillet steak of their data into the mincemeat needed for policy making. But the importance of this step should not be underestimated. Science and policy must work together if we are to achieve a sustainable future for humanity.